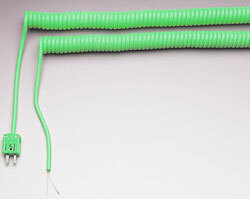 OMEGA™ Retractable Sensor Cable is colour coded and spring coiled, for use with thermocouples, RTD’s and thermistors. To achieve a superior jacket construction, OMEGA has employed the latest in insulating material: TPE (thermoplastic elastomer), a unique family of thermoplastics which exhibits characteristics previously found only in rubber compounds. TPE is extremely tough and flexible, and has excellent abrasion resistance. Our special construction technique yields an expansion rate of up to 500%. OMEGA’s retractable sensor cables are specifically recommended for use with electronic-type indicators, either panel, handheld or bench type models. Retractable sensor cables have hundreds of applications: oscillating machinery, handheld surface probes, or wherever retractable sensor cables are required. 1. Fill the 1st box (1) with desired thermocouple type and colour code. Use symbols “JI”, “KI”, “TI”, “EI” for IEC Colour-coded thermocouple types, “J”, “K”, “T”, “E” for ANSI colour-coded thermocouple types; “RTD” for RTD/Pt100/Pt1000; or “TH” for thermistor. 3. Fill in 3rd box (3) with termination style number (one end). 4. Fill in 4th box (4) with termination style number (other end). 1 per 1 ft (ANSI only).